Spaniard Antonio de Esejo appears to be the first European to reach the Verde Valley and mention its ruins in the 1700s. Mexican and American trappers spread rumors of ruins during the following years but created no written record. In the mid-1880s, a railroad survey took note of abandoned Indian villages in the Verde Valley. Finally in 1884, Edgar A. Mearns, a Fort Verde physician, mapped and surveyed several sites, including the "castle." Scientific studies were initiated by Cosmos Mindeleff of the Smithsonian in 1892, and 3 years later, Jesse W. Fewkes from the Smithsonian also explored the region. Between 1896 and 1900, the Arizona Antiquarian Association performed some emergency repairs on a few of the walls. Subsequently, an underwater exploration of Montezuma Well was conducted with disappointing results. By 1930, 185 sites had been identified in the Verde Valley and surrounding plateau. 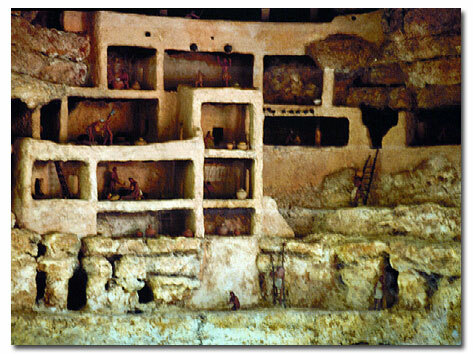 Archeologists regard the Verde Valley as an aboriginal melting pot where at least 4 prehistoric cultures intermingled. 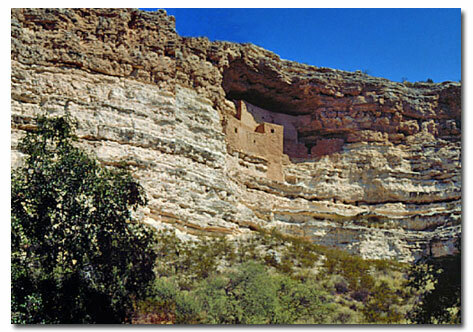 Montezuma Castle National Monument preserves the remains of at least 2 of the cultures that once flourished here. The first permanent settlers in the valley were the Hohokam -- a Pima word for "all used up." These resourceful farmers arrived in the area around 600 AD and lived in one-room houses made of poles, sticks and mud. They irrigated their crops of corn, beans and squash from fissures in limestone rocks which carried water from Beaver Creek and the sinkhole we call Montezuma Well. A semi-subterranean dwelling near the Well is the only typical Hohokam house on display in the National Park Service system. The Sinagua -- Spanish for "without water" -- lived in the nearby foothills and the plateau beyond the valley. Like the Anasazi, they were pithouse dwellers and dry farmers, who depended on rain for their crops. After the Hohokam abandoned the area shortly after the millennium, the Sinagua moved down into the valley and adopted the irrigation systems left by the Hohokam. By 1125, they began to build above ground masonry structures and large pueblos on hilltops or alcoves of cliffs. Sometime after 1125, the Sinagua began building the 5-story, 20-room "castle," which stands in a cliff recess 100 feet above the valley floor. It was so well constructed that it has withstood vandalism and the elements for more than 600 years and remains one of the best preserved prehistoric structures in the deserts of the American Southwest. The prehistoric population in this region peaked in the 1300s and remained stable for another century. Suddenly, and mysteriously, in the early 1400s the Sinagua abandoned the valley, never to return. As vandalism and pothunting became a concern around the turn of the century, a movement was launched to preserve the area as a national monument. On December 8, 1906, President Theodore Roosevelt proclaimed the area Montezuma Castle National Monument, which also incorporated Montezuma Well into its 840 acres. In 1916, the Monument was transferred from jurisdiction of the US Forest Service to the National Park Service, but it wasn't until 1927 that a permanent custodian was named and the resources truly became protected. Abundant water in the Verde Valley offers a rich habitat for deer, antelope, rabbit, muskrat, prairie dogs and ducks and other birds. Montezuma Castle overlooks Beaver Creek, a tributary of the Verde River, which flows through the Verde Valley. The Verde Valley runs between the mountainous highlands -- the Black Hills -- of central Arizona to the south and the southern edge of the Colorado Plateau to the north. The valley was created by the Verde Fault, which eventually caused the Black Hills to be uplifted more than 4,000 feet while impounding the Verde River into series of lakes. Tributary streams drained the limestone surface of the Coconino Plateau from the north into these lakes, creating 3,000-feet-thick deposits called the Verde Formation. Slightly acidic groundwater in limestone regions gradually dissolves passages and caverns in the underground rock. Geologists call this karst topography of which the Verde Valley is a classic example. With changes in ground water levels, underground caverns sometimes collapse, creating sinkholes filled with water. Such is the case with Montezuma Well, which is still a primary source of water for the Verde River. Near Beaver Creek, the generous amount of water gushing from rock crevices was used by prehistoric peoples of the Verde Valley to provide irrigation water their crops.